This Prize-Winning HTML Editor Does It All and Saves Time! Discover Why Webmasters Prefer NoteTab Over Other HTML Editors – Some Costing 10 Times More. Will You Soon be One of Them? You probably already know this, choosing a new HTML editor is not easy. There are so many of them. Which one is right for you? Are you better off with a WYSIWYG program or writing HTML by hand with a code-based editor? And if you go for the second option, should it be a plain text editor? Or an advanced editor for programmers? Or a dedicated HTML editor? There’s two ways to find out. Either download and test as many as you can find. But you probably don’t have the time to do that, right? Or read on to find out if NoteTab is the tool you’ve been looking for. They limit your freedom. They are designed with certain tasks in mind. As a result, you may not be able to add some features that make your site more interesting and useful to visitors. The HTML they create is often unnecessarily bloated and based on outdated standards. This can negatively impact the loading speed of your website and indexing by search engines. The web pages they produce may not be recognized in a different WYSIWYG editor. And because of the bloat, they may also be difficult to read and edit in a regular HTML editor. They discourage you from learning HTML, which is a shame because it really isn’t that hard. To be perfectly honest, you can stop reading here if all you want is a WYSIWYG editor. NoteTab won’t be the right product for you. Or is a Code-Based Editor a Better Choice? One thing's for sure: most webmasters use code-based editors. They give you complete control over your HTML code. And that’s important if you want to allow creativity without limits. But which type of editor is best for you? Screenshot of NoteTab’s main window. Some webmasters (not many) type all their code by hand and swear by programs as basic as Microsoft’s Notepad. You’re probably not one of those or you wouldn’t be here, right? Others use editors designed for programmers. These programs typically have an impressive range of features and offer syntax highlighting for many different file types. But they are often harder to learn and have fewer features specifically for HTML. You won’t find many dedicated HTML editors on the internet. We’ve tested several. Although they have useful tools for creating HTML code, they lack features often offered in regular text editors that also benefit webmasters. What Type of Editor is NoteTab? So what type of program is NoteTab? 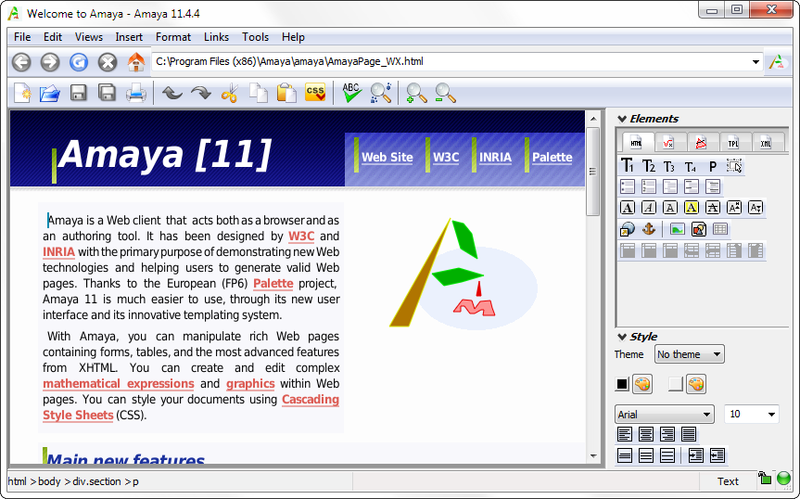 Well it combines the advantages of a dedicated HTML editor and a feature-rich text editor. You can even configure it to be as uncluttered as Microsoft Notepad. And that’s not all. Many webmasters have adopted NoteTab. Here are the top seven reasons why they love it. 1. 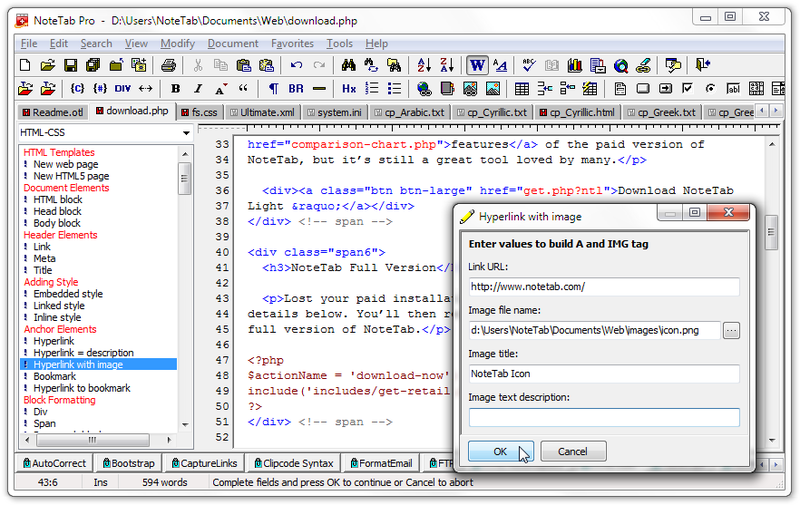 NoteTab is Packed with Features that Speed up HTML Coding. When you edit with NoteTab, you have large collections of quality code-snippets for HTML and CSS available at your fingertips. These snippets (we call them Clips) can be as basic as a single character and as elaborate as a complete web page. You can decide whether to use the latest HTML5 and CSS3 standards. Or stick with HTML4 and CSS2, or XHTML. Or older versions that are compatible with legacy browsers. If you have existing text that you want to convert to HTML, simply use NoteTab’s Document to HTML command. NoteTab will do the job for you in a fraction of a second. Neat isn’t it? NoteTab also makes it easy to manage all your web pages… and multiple websites too. Once you’ve organized them under the Favorites menu, you can easily open a specific page, a selection of them, or all in one go. Each page is then accessible from the convenient tab bar. 2. NoteTab Adapts to Your Way of Working. Gone are the days when you needed to type all your code by hand. But many webmasters still spend a lot of time copy-pasting-editing tags and blocks of HTML. Of course, you can work that in NoteTab too. But why would you want to when there’s a better way? NoteTab’s Clip system in action. Insert tags and other HTML code from a toolbar. Drag-and-drop code snippets from a list to your document. Insert code snippets using the keyboard. Use the auto-complete feature to insert tags as you type. Best of all, NoteTab makes it easy to set attributes for most tags. When you insert a snippet, a dialog box pops up with common attributes and values that you can choose from. And unlike any other HTML editor, you can modify code snippets and tag attributes to your heart’s content. 3. NoteTab Supports Twitter’s Bootstrap. NoteTab’s Bootstrap Clip library in action. Bootstrap provides all the building blocks you need to create a professional-looking website quickly and easily. You no longer have to mess around with CSS to get a consistent look and feel across browsers. What a time saver! Need an example of a Bootstrap website? You’re looking at one right now! NoteTab is the first (and currently only) editor in the world that supports Twitter’s Bootstrap. This means you’ll be able to put together a Bootstrap website faster with NoteTab than with any other editor. That’ll give you quite an advantage over other webmasters. Think of all the nice things you can do with the time you’ll save. 4. NoteTab Uses Syntax Highlighting That Doesn’t Make You Dizzy. Want to know a secret? Most text and HTML editors with syntax highlighting (and there are hundreds) are based on the same two or three input controls. That’s why there are so few editors that break the mold. The other problem with these popular input controls is that they’ve gone overboard with syntax highlighting. Look at any code in them and you typically get an overwhelming mix of colors. You can’t separate the trees from the forest. Sounds familiar? The truth is, developers have forgotten that the main purpose of syntax highlighting is to make your code easier to read. Silly isn’t it? You won’t experience this problem with NoteTab. We use a carefully customized input control that you won’t find in any other HTML editor. It’s not only highly optimized for speed, but uses a careful balance of syntax highlighting for HTML and CSS that won’t make you dizzy. NoteTab’s syntax highlighting won’t make you dizzy. An example of syntax highlighting gone overboard. 5. 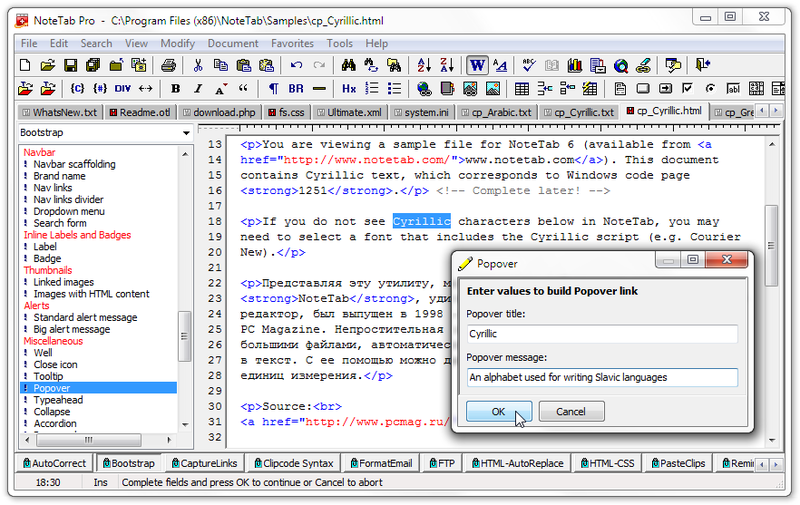 NoteTab is Also a Full-Fledged Text Editor. When you’re creating a web page you also need regular text-editing tools. Surprisingly many of these are missing in dedicated HTML editors. We tried some of the most popular ones and found they only offered very basic search and replace tools. Yet this is one of the most commonly used editing features! Most didn’t offer tools to extract word statistics from a document, which is essential for search engine optimization (SEO). Nobody wants their site penalized for overusing keywords. Worse still, most of those programs are bloated and slow to start up. What do you get with NoteTab? Rock solid search and replace tools that support wildcards and, for advanced users, regular expressions. You can search and replace within a selection of text, a whole document, all open documents, and even unopened files on your drive. This is a huge time saver when you need to make global changes across your website. To help with your writing, NoteTab includes an English thesaurus and a multilingual spell checker. It also provides easy keyboard shortcuts to insert smart quotes and apostrophes – a must if you take typography seriously. And you can get detailed word and paragraph statistics at the touch of a button – features that are valued by copywriters and SEO experts. You can learn more about NoteTab’s other unique text editing features on our Text Editing page. 6. NoteTab is a Great Tool for Learning HTML. Since the late 1990s, many online HTML courses have recommended NoteTab as the ideal learning tool. Why? Because NoteTab’s unique snippet system makes it so easy to find the right HTML tags and insert them into your web page. And that’s not all. Some teachers even create custom snippet collections (Clip Libraries). That way their students have just the HTML tags and code needed for the lesson. No other editor offers this kind of flexibility. NoteTab is appreciated by beginners and experts alike. It’s a program that grows with you and adapts to your way or working. Best of all, as a NoteTabber, you can join our free webmaster discussion group and ask the experts any questions you have. You can participate in the group through your web browser or by email. If you don’t want to join the group, simply search its archives without signing up. 7. NoteTab is Lean, Fast, and Reliable. NoteTab has been around since 1996. That’s quite a bit longer than most other text and HTML editors available today. Not only does it pack many years of experience, but it has been extensively tested on many different kinds of systems. At Fookes Software we work hard to develop high quality code that is bloat-free and highly optimized for speed. As a result you benefit from software that is lean, fast, and reliable. This quality is recognized by leading software reviewers and, of course, by NoteTab users. NoteTab has won awards from PC Magazine, PC World and WUGNET. 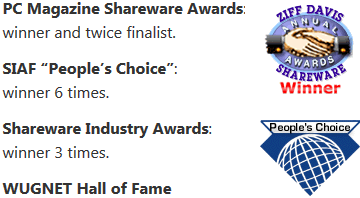 And the Shareware Industry Awards 3 times. But we’re especially proud of our 6 People’s Choice Awards. In fact no other HTML or text editor has won so many prestigious awards. Is NoteTab the best tool for everybody? To be perfectly honest the answer is no. There are a few things that some other editors do better than NoteTab. For example, NoteTab cannot edit Unicode files with special characters and symbols that don’t co-exist within one of the ANSI character sets. However, that’s not a problem with the vast majority of web pages – NoteTab will do a fine job editing them. If you value a tool’s appearance more than its capabilities, then NoteTab is probably not for you. Our priority is high-quality productivity features as well as backwards compatibility. We’ve worked hard to make sure NoteTab runs on as many Windows versions as possible, including the older ones. As a result we can’t always choose the best looking components. 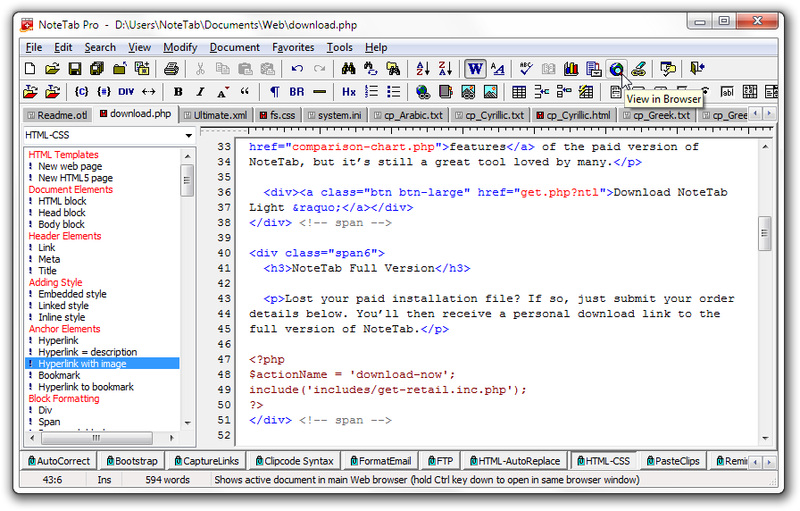 Is NoteTab the Best HTML Editor for You? We’d like to think you’ll feel the same way. But the best way to find out is to use our 30-day free trial. You can download it without giving any personal or credit card details. And you’ll be up and running in minutes. No doubt about it, once you’ve discovered NoteTab’s unique features you’ll be amazed how much more you’ll get done in less time. Try it! Your Money Back if you’re Not 100% Satisfied! We’re so sure you’ll love NoteTab that we’ll fully refund your order if you’re not completely satisfied, for whatever reason, within 90 days. You’ve got nothing to lose! Don’t wait any longer. Get your personal copy of NoteTab now. And become a proud member of the smart and savvy NoteTab community today. Ordering NoteTab is easy, fast and safe. You can pay by credit card, PayPal or wire transfer. You’ll receive a download link to the setup file as soon as your order is completed. Usually in a matter of seconds. A single-user license costs only $39.95 US (that’s less than 80 cents per week for a year). Quantity discounts are available and automatically applied. A license is valid indefinitely. Minor updates are free and you get a 50% upgrade discount if you choose to buy the next major version. And best of all, you can run NoteTab on several computers as long as you’re the only user, and only one copy is used at a time. So remember, NoteTab is packed with time-saving productivity tools that you won’t find in any other HTML editor – you’d have to buy several to come close. NoteTab is fast and reliable and grows with you. Your number one benefit with NoteTab? Get more done in less time. Furthermore, NoteTab is the only editor with so many prestigious awards. Including 6 People’s Choice Awards. How about that for peace of mind! You too can join the smart and savvy community of NoteTabbers. Buy your license now and start enjoying our prize-winning software within minutes. 100% satisfaction guaranteed or your money back.